This is “Understanding Organizational Culture”, section 15.1 from the book An Introduction to Organizational Behavior (v. 1.0). For details on it (including licensing), click here. Organizational cultureA system of shared assumptions, values, and beliefs showing people what is appropriate and inappropriate behavior. refers to a system of shared assumptions, values, and beliefs that show employees what is appropriate and inappropriate behavior.Chatman, J. A., & Eunyoung Cha, S. (2003). Leading by leveraging culture. California Management Review, 45, 19–34; Kerr, J., & Slocum, J. W., Jr. (2005). Managing corporate culture through reward systems. Academy of Management Executive, 19, 130–138. These values have a strong influence on employee behavior as well as organizational performance. In fact, the term organizational culture was made popular in the 1980s when Peters and Waterman’s best-selling book In Search of Excellence made the argument that company success could be attributed to an organizational culture that was decisive, customer oriented, empowering, and people oriented. Since then, organizational culture has become the subject of numerous research studies, books, and articles. However, organizational culture is still a relatively new concept. In contrast to a topic such as leadership, which has a history spanning several centuries, organizational culture is a young but fast-growing area within organizational behavior. Culture is by and large invisible to individuals. Even though it affects all employee behaviors, thinking, and behavioral patterns, individuals tend to become more aware of their organization’s culture when they have the opportunity to compare it to other organizations. If you have worked in multiple organizations, you can attest to this. Maybe the first organization you worked was a place where employees dressed formally. It was completely inappropriate to question your boss in a meeting; such behaviors would only be acceptable in private. It was important to check your e-mail at night as well as during weekends or else you would face questions on Monday about where you were and whether you were sick. Contrast this company to a second organization where employees dress more casually. You are encouraged to raise issues and question your boss or peers, even in front of clients. What is more important is not to maintain impressions but to arrive at the best solution to any problem. It is widely known that family life is very important, so it is acceptable to leave work a bit early to go to a family event. Additionally, you are not expected to do work at night or over the weekends unless there is a deadline. These two hypothetical organizations illustrate that organizations have different cultures, and culture dictates what is right and what is acceptable behavior as well as what is wrong and unacceptable. An organization’s culture may be one of its strongest assets, as well as its biggest liability. In fact, it has been argued that organizations that have a rare and hard-to-imitate organizational culture benefit from it as a competitive advantage.Barney, J. B. (1986). Organizational culture: Can it be a source of sustained competitive advantage? Academy of Management Review, 11, 656–665. In a survey conducted by the management consulting firm Bain & Company in 2007, worldwide business leaders identified corporate culture as important as corporate strategy for business success.Why culture can mean life or death for your organization. (2007, September). HR Focus, 84, 9. This comes as no surprise to many leaders of successful businesses, who are quick to attribute their company’s success to their organization’s culture. Culture, or shared values within the organization, may be related to increased performance. Researchers found a relationship between organizational cultures and company performance, with respect to success indicators such as revenues, sales volume, market share, and stock prices.Kotter, J. P., & Heskett, J. L. (1992). 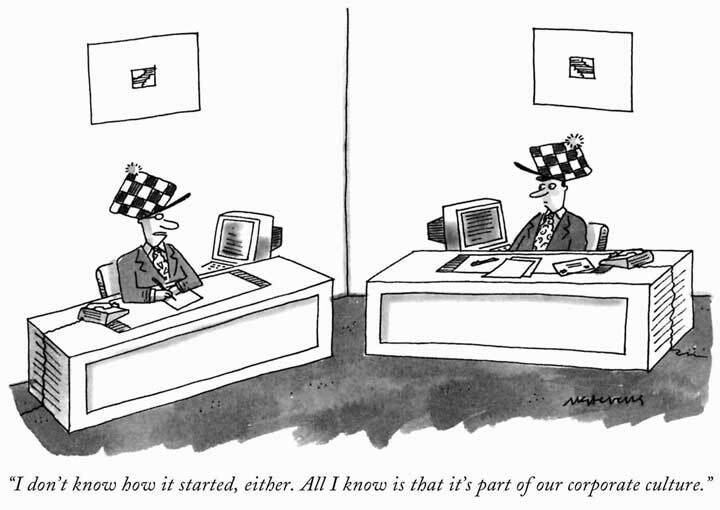 Corporate culture and performance. New York: Free Press; Marcoulides, G. A., & Heck, R. H. (1993, May). Organizational culture and performance: Proposing and testing a model. Organizational Science, 4, 209–225. At the same time, it is important to have a culture that fits with the demands of the company’s environment. To the extent shared values are proper for the company in question, company performance may benefit from culture.Arogyaswamy, B., & Byles, C. H. (1987). Organizational culture: Internal and external fits. Journal of Management, 13, 647–658. For example, if a company is in the high-tech industry, having a culture that encourages innovativeness and adaptability will support its performance. However, if a company in the same industry has a culture characterized by stability, a high respect for tradition, and a strong preference for upholding rules and procedures, the company may suffer as a result of its culture. In other words, just as having the “right” culture may be a competitive advantage for an organization, having the “wrong” culture may lead to performance difficulties, may be responsible for organizational failure, and may act as a barrier preventing the company from changing and taking risks. In addition to having implications for organizational performance, organizational culture is an effective control mechanism for dictating employee behavior. Culture is in fact a more powerful way of controlling and managing employee behaviors than organizational rules and regulations. When problems are unique, rules tend to be less helpful. Instead, creating a culture of customer service achieves the same result by encouraging employees to think like customers, knowing that the company priorities in this case are clear: Keeping the customer happy is preferable to other concerns such as saving the cost of a refund. © The New Yorker Collection. 1994. Mick Stevens from cartoonbank.com. All rights reserved. Organizational culture consists of three levels. At the deepest level, below our awareness lie basic assumptionsTaken for granted beliefs about human nature and reality.. Assumptions are taken for granted, and they reflect beliefs about human nature and reality. At the second level, valuesShared principles, standards, and goals. exist. Values are shared principles, standards, and goals. Finally, at the surface we have artifactsThe visible and tangible elements of culture., or visible, tangible aspects of organizational culture. For example, in an organization one of the basic assumptions employees and managers share might be that happy employees benefit their organizations. This assumption could translate into values such as social equality, high quality relationships, and having fun. The artifacts reflecting such values might be an executive “open door” policy, an office layout that includes open spaces and gathering areas equipped with pool tables, and frequent company picnics in the workplace. For example, Alcoa Inc. designed their headquarters to reflect the values of making people more visible and accessible, and to promote collaboration.Stegmeier, D. (2008). Innovations in office design: The critical influence approach to effective work environments. Hoboken, NJ: John Wiley. In other words, understanding the organization’s culture may start from observing its artifacts: the physical environment, employee interactions, company policies, reward systems, and other observable characteristics. When you are interviewing for a position, observing the physical environment, how people dress, where they relax, and how they talk to others is definitely a good start to understanding the company’s culture. However, simply looking at these tangible aspects is unlikely to give a full picture of the organization. An important chunk of what makes up culture exists below one’s degree of awareness. The values and, at a deeper level, the assumptions that shape the organization’s culture can be uncovered by observing how employees interact and the choices they make, as well as by inquiring about their beliefs and perceptions regarding what is right and appropriate behavior. Organizational culture is a system of shared assumptions, values, and beliefs that help individuals within an organization understand which behaviors are and are not appropriate within an organization. Cultures can be a source of competitive advantage for organizations. Strong organizational cultures can be an organizing as well as a controlling mechanism for organizations. 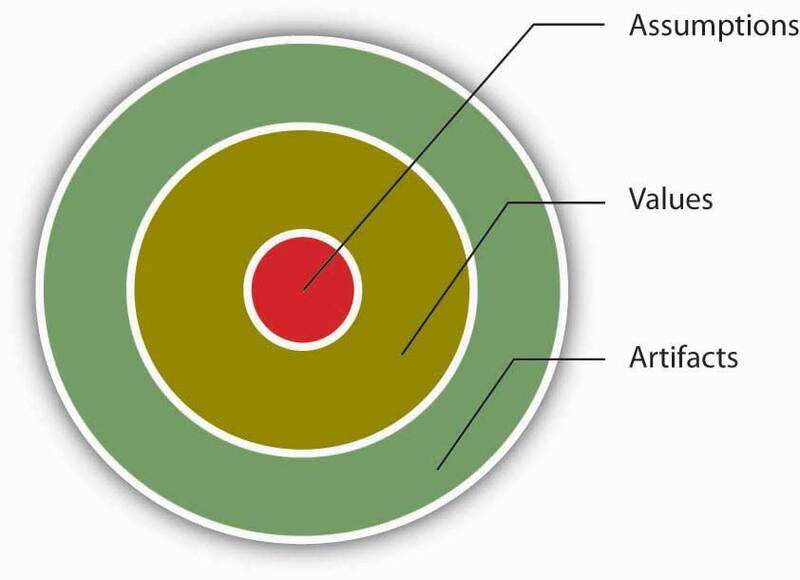 And finally, organizational culture consists of three levels: assumptions, which are below the surface, values, and artifacts. Give an example of an aspect of company culture that is a strength and one that is a weakness.